Decisions by the Fed's Federal Open Market Committee are based in part on the Greenbook forecasts. These forecasts are produced by the Federal Reserve Board’s staff and are presented to the FOMC prior to their policy meetings, but are not made public for another five years. This column shows that the minutes of those FOMC meetings can help infer the Fed staff's Greenbook forecasts of the US real GDP growth rate, years before the Greenbook's public release. The FOMC minutes are thus highly informative about a key input to monetary policymaking. Monetary policy decisions by the Fed’s Federal Open Market Committee (FOMC) have attracted considerable attention in recent years, especially with quantitative easing through large-scale asset purchases, the introduction of forward guidance, December 2015’s ‘lift-off’ after seven years of a near-zero federal funds rate, and subsequent additional rate increases. The FOMC’s decisions are based in part on the Greenbook forecasts, which are economic forecasts produced by the Federal Reserve Board’s staff and which are presented to the FOMC prior to their policy meetings. This column shows that the minutes of the FOMC meetings – and the information in those minutes about the Greenbook forecasts – provide valuable insights into the decision-making process of the FOMC. Recent analysis by Stekler and Symington (2016) and Ericsson (2016) lays the foundation for these results. 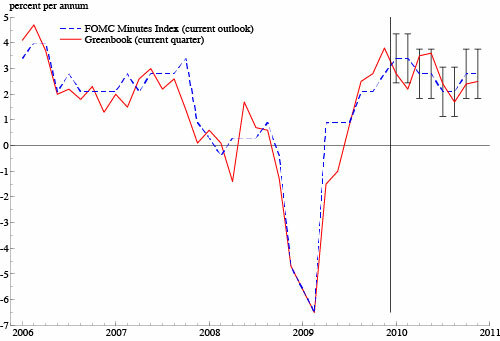 Stekler and Symington constructed indexes that quantify the FOMC’s views about the US economy, as expressed in the minutes of the FOMC’s meetings for 2006–2010. In this column, I compare these indexes with publicly available Greenbook forecasts, including the recently released 2010 Greenbook forecasts. The indexes very closely track the Greenbook forecasts of the current-quarter and one-quarter-ahead US real GDP growth rates – particularly so for the 16 forecasts in 2010, even though those forecasts were not available when the indexes were constructed. Stekler and Symington’s indexes thus provide a proximate and relatively accurate mechanism for inferring Greenbook forecasts, well in advance of the public release of the Greenbook. The Greenbook is not released to the public until more than five years after it is presented to the FOMC, whereas the minutes of an FOMC meeting are published just three weeks after the meeting itself. Stekler and Symington (2016) employed a focused textual analysis of the minutes for the 40 FOMC meetings during 2006–2010, a period that spans the financial crisis and leads into the Great Recession. From their textual analysis, Stekler and Symington constructed quantitative indexes that gauge the FOMC’s views on the current and future strength of the US economy, as expressed in the FOMC minutes themselves. The indexes are scaled such that they correspond to real GDP growth rates in percent per annum. Source: Stekler and Symington (2016, Tables 2 and 4). the future economic outlook, typically in a paragraph or paragraphs beginning “In their discussion of the economic situation and outlook, meeting participants …”. In these sets of paragraphs, Stekler and Symington searched for select keywords that characterise views on the outlook. Keywords range from “strong” and “robust” for a very optimistic outlook to “recession” and “contraction” for a very pessimistic one. From the frequencies of occurrence of the keywords, Stekler and Symington created two indexes: one for the current outlook and one for the future outlook. These indexes are referred to as FOMC minutes indexes (or FMIs) below. 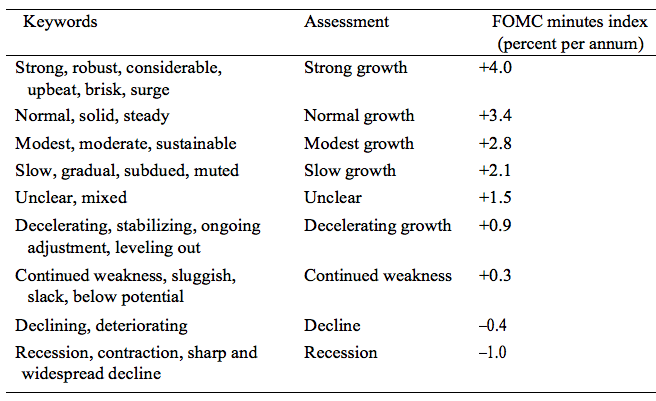 Table 1 lists the keywords, Stekler and Symington’s assessment of those keywords for economic growth, and the corresponding values for the FMI. From a broader perspective, three steps lead to the FMIs. Meeting of the FOMC. The FOMC meets to discuss monetary policy, with the Greenbook forecasts and certain qualitative and quantitative information in hand. The Greenbook forecasts are provided to the FOMC participants, prior to the FOMC meeting, and hence the FMI – through the FOMC’s policymaking process – may depend on the Greenbook forecasts. This characterisation applies to the FMIs for both the current outlook and the future outlook. It is thus of interest to compare the FMI directly with the Greenbook forecast, as in Figure 1. 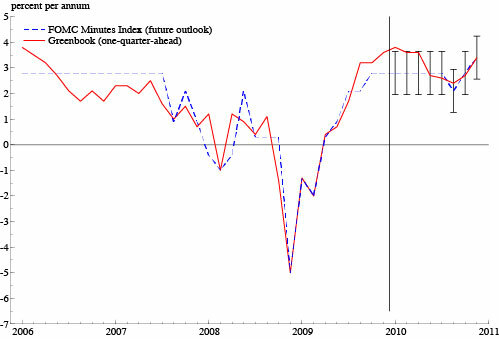 Figure 1a plots two ‘nowcasts’: the FMI for the current outlook, and the Greenbook forecast for the current quarter. Figure 1b plots two forecasts: the FMI for the future outlook, and the Greenbook forecast for one quarter ahead. Figure 1c plots the difference between the FMI for the current outlook and the Greenbook forecast for the current quarter (h=0); and Figure 1d plots the difference between the FMI for the future outlook and the Greenbook forecast for one quarter ahead (h=1). In Figure 1 (and likewise in Figures 2 and 3 below), the horizontal axis specifies the date of the FOMC meeting to which a Greenbook is submitted and from which an FMI is constructed. The charts in Figure 1 show that the FMI and the Greenbook forecasts are generally very close numerically, whether for the current outlook or for the future outlook. Figure 2 plots the truncation-adjusted current-outlook FMI, along with the Greenbook forecast of the current quarter’s US real GDP growth rate. The FMI and the Greenbook forecast are very close numerically, with deviations between them being small, typically less than 1% per annum and often less than 0.5% per annum. Figure 3 plots the truncation-adjusted future-outlook FMI and the Greenbook forecast for one quarter ahead. Their deviations are small as well. Figures 2 and 3 also include ±1 standard error bands for the FMI in 2010, with those bands derived from the properties of the FMIs and the Greenbook forecasts over 2006–2009. For each FMI (current-outlook or future-outlook), only one of the eight Greenbook forecasts in 2010 lies outside those bands – significantly fewer outliers than the one-in-three expected for ±1 standard error bands. The 2010 predictions range between 2.1% and 3.4% for both the current outlook and the future outlook, with somewhat different dynamics for the two forecast horizons. The forecast standard error is under 1%. Note: Units are quarterly rates, in percent per annum. 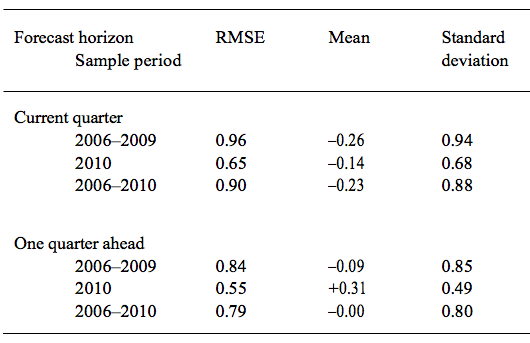 In light of the discussion above, Table 2 numerically assesses the discrepancies between the FMIs and the Greenbook forecasts over three periods: 2006–2009, 2010, and 2006–2010. Root mean squared errors (RMSEs) are less than 1% per annum for all sample periods and for both forecast horizons. Notably, the one-quarter-ahead RMSEs are smaller than the current-quarter RMSEs. That is, Stekler and Symington’s indexes are more accurate at inferring the one-quarter-ahead Greenbook forecast than the current-quarter Greenbook forecast. Also, both FMIs are much more accurate at inferring the Greenbook forecasts for 2010 than they are at inferring the Greenbook forecasts for 2006–2009. Several features of these results are notable. Textual analysis – such as that employed by Stekler and Symington (2016) – is common in the literature. Similar examples include Boukus and Rosenberg (2006), who assess the roles of different themes in the FOMC’s minutes, and Meade et al. (2015), who calculate the changing frequencies of different quantitative words in the FOMC’s minutes to ascertain the diversity of views among the FOMC members and participants. Stekler and Symington’s analysis is novel by quantifying qualitative text from the minutes on the outlook. By contrast, Meade et al. focus on the disparity of views in the minutes, rather than on some central tendency of views. Banternghansa and McCracken (2009, 2014) likewise focus on the disparity of views, albeit as measured by individual participants’ economic forecasts. Yet other researchers such as Nunes (2013) have compared the Greenbook forecasts and FOMC participants’ forecasts with each other, with other forecasts, and with the actual outcomes. The current-outlook FMI draws on text about the Federal Reserve Board staff’s views, whereas the future-outlook FMI ostensibly reflects the views of the FOMC participants on both current conditions and future outlook. While these nuances may affect the interpretation of the FMIs when compared with the Greenbook forecasts, the similarity of the FMIs and the Greenbook forecasts suggests not. It may seem surprising that FOMC participants’ views on the future outlook – as measured by the future-outlook FMI – are well-captured by the one-quarter-ahead Greenbook forecast, since the policy-relevant horizon may be somewhat longer than just one quarter ahead. The future-outlook FMI may thus be an even better proxy for Greenbook forecasts at longer horizons. Or, participants may down-weight Greenbook forecasts at longer horizons if they view those forecasts as being uninformative; see Chang and Hanson (2016). Indexes have yet to be constructed for 2011–2017 or for the period prior to 2006. Indexes over those periods may be more or less accurate than those over 2006–2010. The indexes also could be generated algorithmically, drawing on Table 1. Stekler and Symington (2016) proposed and built innovative quantitative indexes (the ‘FMIs’) that measure the extent of optimism or pessimism expressed in the FOMC’s minutes on the current and future outlook for the US economy. Even though the text that Stekler and Symington examined includes little or no quantitative information, Stekler and Symington’s FMIs reveal much about the thinking of the FOMC participants and about the Federal Reserve Board staff’s input to the FOMC meetings. These indexes can help infer the staff’s Greenbook forecasts of the US real GDP growth rate, years before the public release of the Greenbook. The FOMC minutes are thus highly informative about a key input to monetary policymaking. Author’s note: The views expressed in this column are solely the responsibility of the author and should not be interpreted as necessarily representing or reflecting the views of the Federal Open Market Committee, its principals, the Board of Governors of the Federal Reserve System, or of any other person associated with the Federal Reserve System. This column uses publicly available information, and only publicly available information. It does not use any internal or confidential Federal Reserve Board information, either directly or indirectly. The author is grateful to Chris Erceg, Lowell Ericsson, Nancy Ericsson, Joe Gruber, David Hendry, Lucas Husted, Matteo Iacoviello, Freja Ingelstam, Aaron Markiewitz, Jaime Marquez, Ellen Meade, J Seymour, Tara Sinclair, Herman Stekler, and Joyce Zickler for helpful discussions and comments. All numerical results were obtained using PcGive Version 14.0B3, Autometrics Version 1.5e, and Ox Professional Version 7.00 in 64-bit OxMetrics Version 7.00: see Doornik and Hendry (2013) and Doornik (2009). Banternghansa, C, and M W McCracken (2009) “Forecast Disagreement Among FOMC Members”, Federal Reserve Bank of St. Louis Working Paper No. 2009–059A, Research Division, Federal Reserve Bank of St. Louis, St. Louis, Missouri, December. Banternghansa, C, and M W McCracken (2014) “The Effect of FOMC Forecast Disagreement on U.S. Treasuries”, Presentation, International Symposium on Forecasting, Rotterdam, The Netherlands, July 1. Boukus, E, and J V Rosenberg (2006) “The Information Content of FOMC Minutes”, mimeo, Federal Reserve Bank of New York, New York, July. Chang, A C, and T J Hanson (2016) “The Accuracy of Forecasts Prepared for the Federal Open Market Committee”, Journal of Economics and Business, 83: 23–43. Danker, D J, and M M Luecke (2005) “Background on FOMC Meeting Minutes”, Federal Reserve Bulletin, 2005(Spring): 175–179. Doornik, J A (2009) “Autometrics”, Chapter 4 in J L Castle and N Shephard (eds. ), The Methodology and Practice of Econometrics: A Festschrift in Honour of David F. Hendry, Oxford University Press, Oxford, 88–121. Doornik, J A, and D F Hendry (2013) PcGive 14, Timberlake Consultants Press, London (3 volumes). Ericsson, N R (2016) “Eliciting GDP Forecasts from the FOMC’s Minutes Around the Financial Crisis”, International Journal of Forecasting, 32(2): 571–583. Meade, E E, N A Burk, and M Josselyn (2015) “The FOMC Meeting Minutes: An Assessment of Counting Words and the Diversity of Views”, FEDS Note, Board of Governors of the Federal Reserve System, Washington, D.C., 26 May. Nunes, R (2013) “Do Central Banks’ Forecasts Take Into Account Public Opinion and Views?”, International Finance Discussion Paper No. 1080, Board of Governors of the Federal Reserve System, Washington, D.C., May. Stekler, H O, and H Symington (2016) “Evaluating Qualitative Forecasts: The FOMC Minutes, 2006–2010”, International Journal of Forecasting, 32(2): 559–570. 1. See Danker and Luecke (2005) for a valuable perspective on the evolution of the FOMC’s minutes. 2. In fact, Stekler and Symington’s procedure itself involves two steps but, for expositional purposes, this description merges them into a single-step quantification of the FOMC minutes. 3. Ericsson (2016, Sections 2–3) describes the econometric methodology for handling these three meetings during the extenuating circumstances of the financial crisis, and provides details of the online sources for the publicly available Greenbook forecasts and FOMC minutes. 4. Starting in 2010, the Greenbook forecasts appear in a Fed document called the Tealbook, which combines the previous Fed documents called the Greenbook and the Bluebook. For simplicity, these more recent forecasts are still referred to as “Greenbook forecasts” herein.